I feel like I’ve been away from you guys forever! This summer has been MUCH too busy and crazy. I was in an accident last week. A lady ran a stop sign looking at her phone, grrr! Goodbye to my pretty Yukon that I have loved for the past 8 years. Luckily my sister and I were both okay, some whiplash and back pain but we consider ourselves very lucky. What that means for me though is that I have been dealing with insurance, doctors, chiropractors and looking for a new car. Not the way I envisioned my last few weeks of summer that I kept free to play with the family and get ready for our trip to DISNEYLAND! 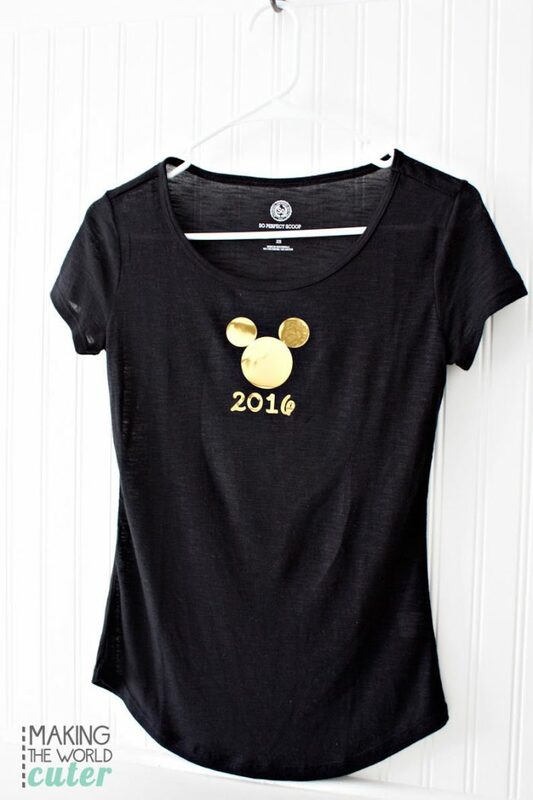 These DIY Disney shirts got were a priority though! 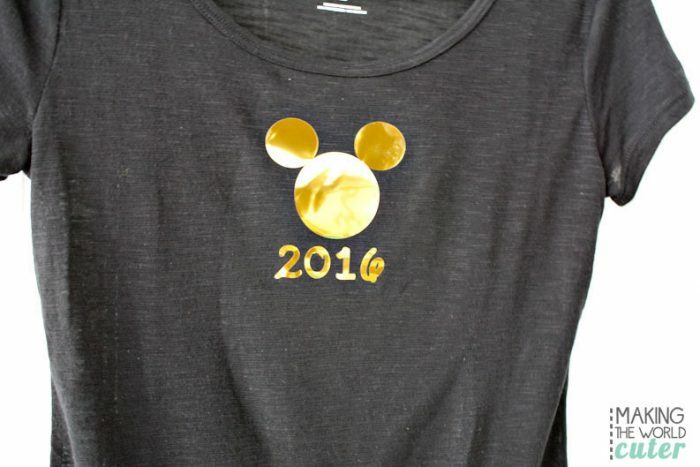 These shirts are just like the ones I made two years ago, but of course we added the 2016. My kids wanted to do this year in gold because they are OBSESSED with the Olympics and gold medals. Mickey always wins the gold in my book. I love Disney so so much, and get a little teary eyed thinking about going. We have made so many good memories there as a family. We are leaving in 21 days, but who’s counting? Oh that’s right, I am. We started out by taking the family to Kohl’s and we all picked out a t-shirt we liked. I used my 30% off coupon and a $10 off coupon, and my Kohl’s cash and got them for like pretty much a couple dollars. I love stacking coupons at Kohl’s. It’s my favorite past time! Ha! 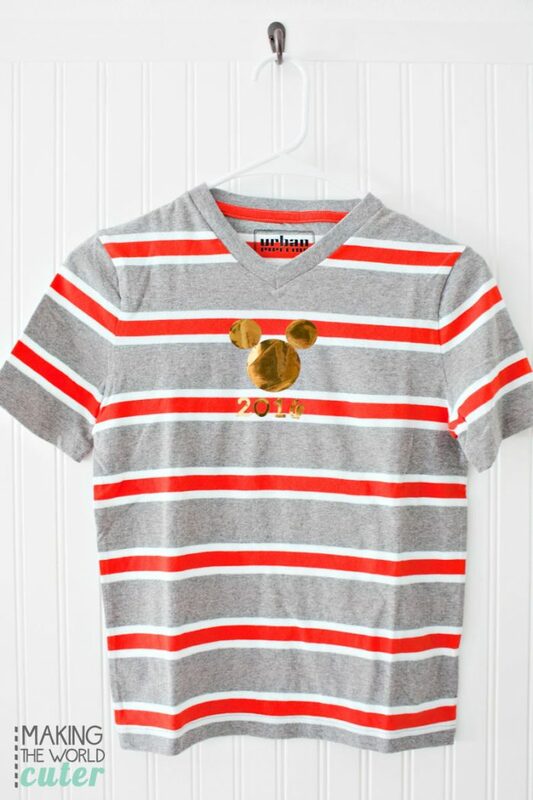 My boys picked out striped shirts, and I always love how those turn out. My husband picked out a sporty blue and my daughter and I got some lightweight black shirts. 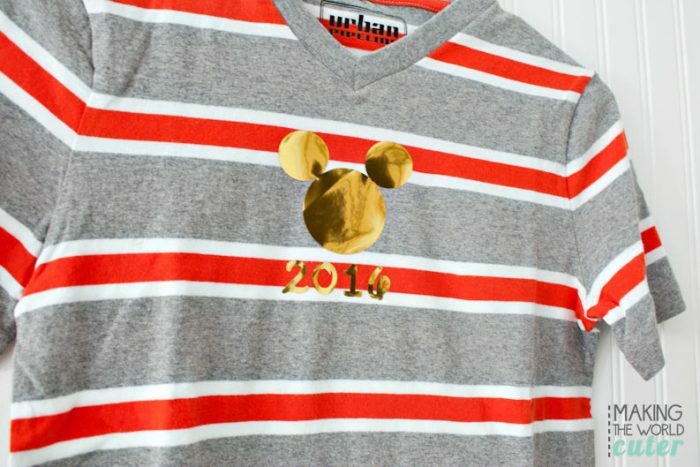 I love that we could all get a shirt we liked, but by adding the vinyl they all go together! 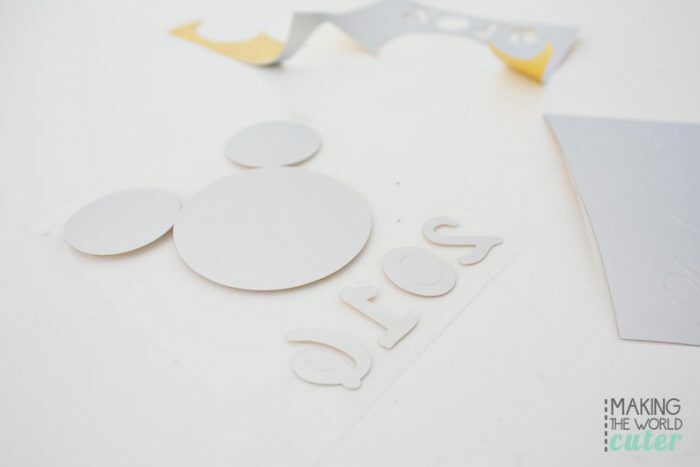 Other than the shirts you’ll need a Silhouette to cut the shapes, an iron and some gold mirrored vinyl from Expressions Vinyl. 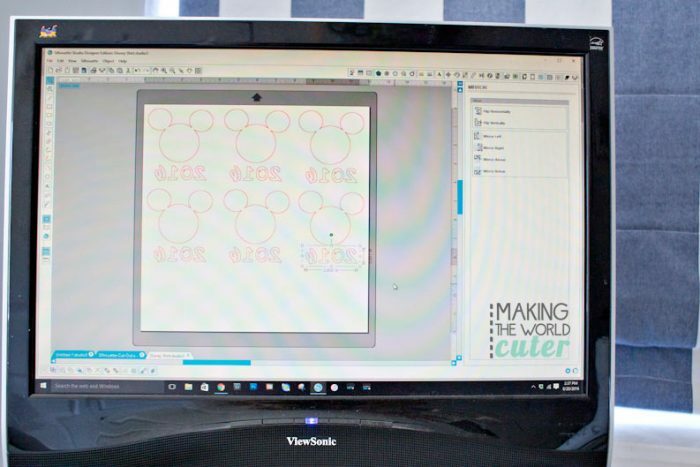 The design was made in Silhouette design studio by merging circles together to make the Mickey shape. The date is in a font called Waltograph. I then mirrored the whole thing. 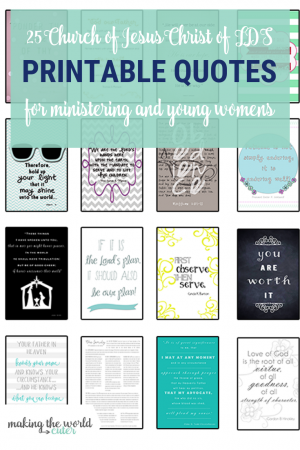 If you would like to download the design into your studio, use this link to my dropbox. 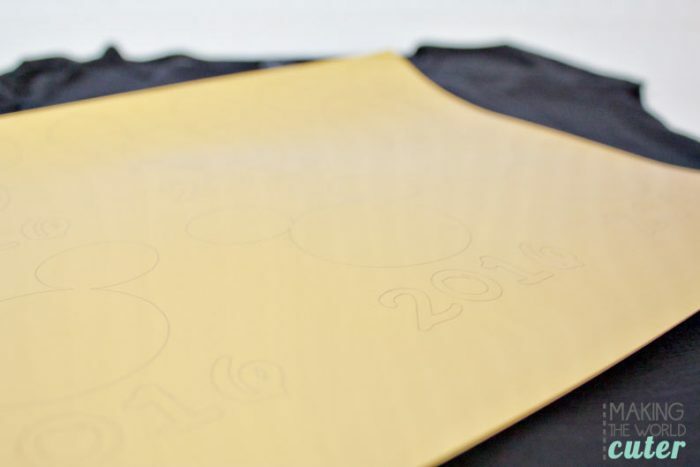 Place the vinyl gold side down on your cutting mat. Set your settings for heat transfer material flocked because it is a little thicker. You’ll turn your blade to 3. 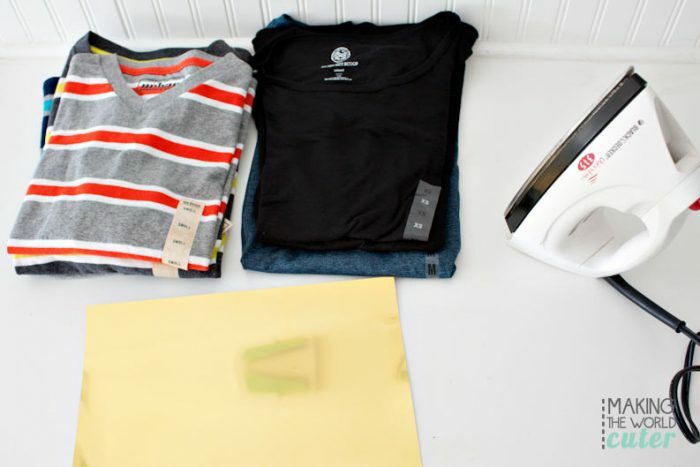 Cut your designs into squares for each shirt. 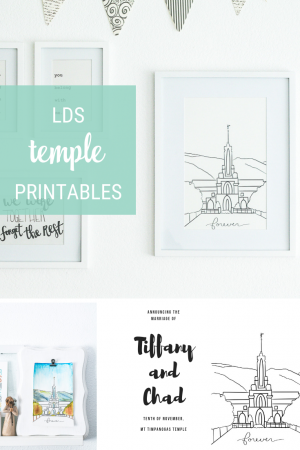 I LOVE this vinyl because it has it’s own transfer sheet that you can iron directly on, and it’s SO easy to weed. 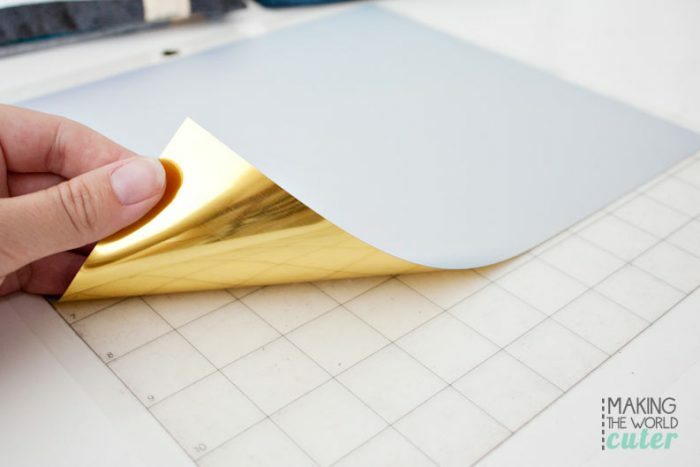 If you can’t get between the gold and transfer sheet, just use the sharp point of an exacto knife to get it separated, and then peel. Pull out the middle of the 0 and the 6. 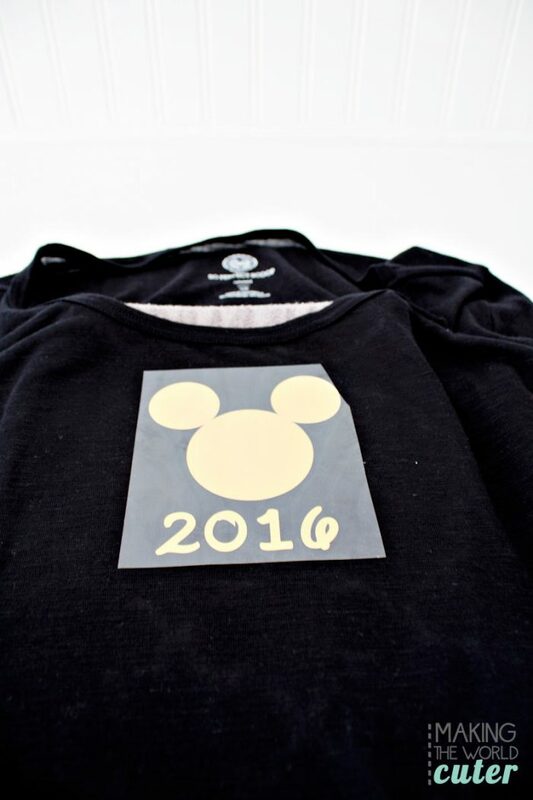 Line your vinyl on the middle of the DIY Disney shirt closer to the collar. 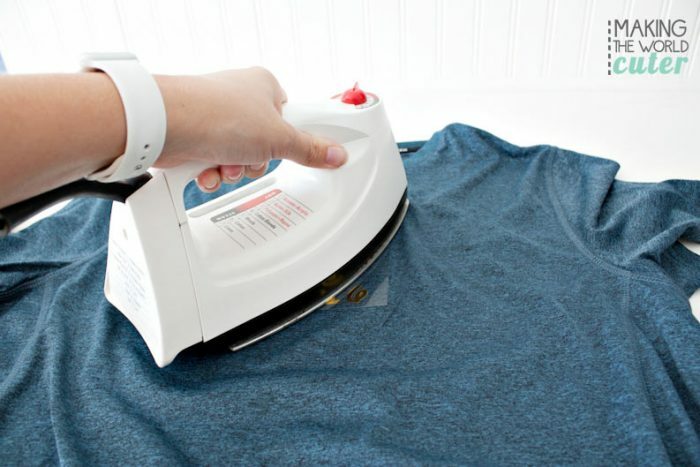 With the iron setting to medium (mine is on 3 out of 6, the highest before it goes to steam), press and iron for at least 30 seconds with medium pressure. Peel up the plastic carefully while still warm. I then took a piece of cloth and ironed it one more time just to make sure that it wasn’t going anywhere after pulling up the transfer paper. 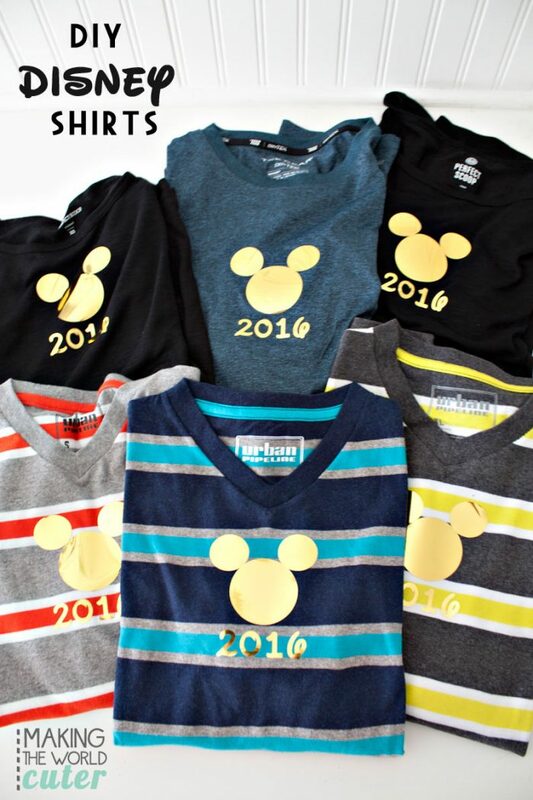 Disneyland is ready to see your shirt! 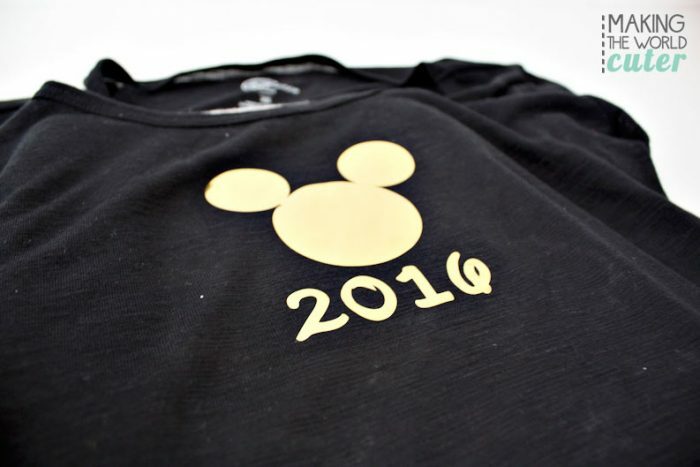 I didn’t realize it until I was writing the title Mickey 2016…and it sounded like a campaign slogan. Let’s just say I’d vote for Mickey Mouse at this point. I think he’d have a pretty good chance at winning too! Ha! I love that gold! It’s a little hard to get the full effect of how shiny and mirrored it is, but it’s really pretty. 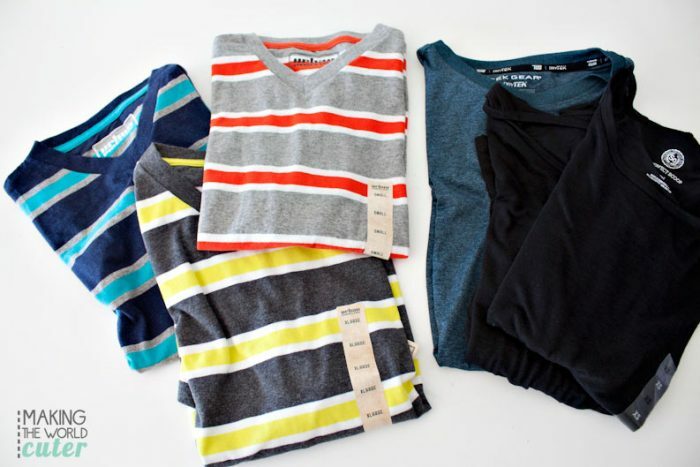 I said it before, I love it on the stripes! So cute! Anyone else going to Disneyland this fall? Or maybe at Christmas time? 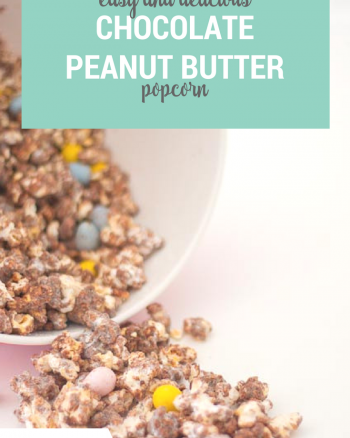 I want to hear what your favorite treat is at the park! Mine is probably the beignets…but there are so many yummy ones! Squeal! I can’t wait! 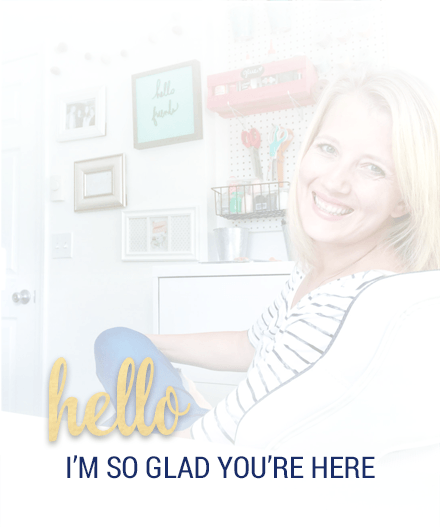 Be sure to check out all my Disney projects…and just know there are more fun things coming!